Sara Rutland discovered aviation nearly twenty years ago in South Florida while serving as a professional Firefighter/Paramedic. In the early 2000s, she retired as a Lieutenant after twenty years in the professional fire/rescue service and entered the aviation world full-time. Today, Sara holds an Airline Transport Pilot License (Multi-Engine Land), a jet type rating, Commercial Single Engine Sea, Commercial Single Engine Land, and Single and Multi-Engine Certified Flight Instructor Certificates. She has accumulated more than 5000 hours of flight time in the Airline, Corporate and Private aviation sectors. As a founding partner of Shoreline Aviation Services, Sara offers a unique perspective through the diversity of her experience. She works tirelessly at Shoreline, sharing her love of aviation with others and constantly striving to offer the best possible service to Shoreline's clients. 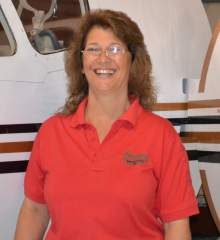 She serves clients throughout the country and is a driving force behind Shoreline Aviation Services, LLC.